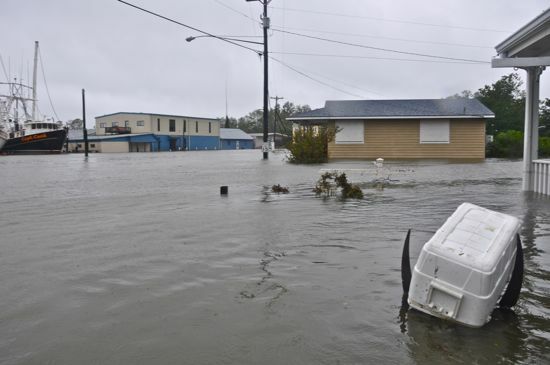 rene’s storm surge on Saturday morning is estimated to have been 9-1/2 feet in Oriental, roughly 4 inches higher than in 2003’s Hurricane Isabel. Water in some downtown streets was chest high. The peak of the waters came between 8 and 9a followed by the calm eye of Irene. It was a long eye, as eyes go. At 10:30a, a TownDock crew took to the streets in a canoe to survey the landscape, much of which was under water. Hodges Street in front of the Village Gallery where a cooler appeared to have come to rest on one of the sculptures out in front. 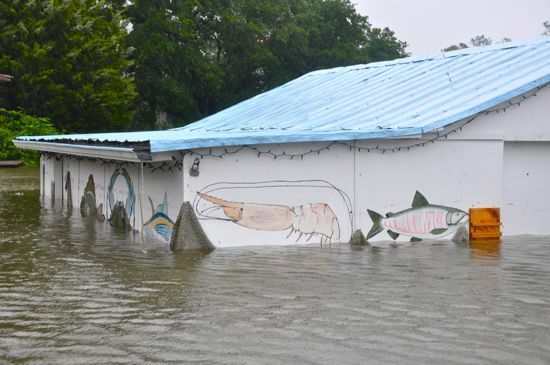 The building with the white boards over windows is The Bean which took on water during the height of the surge. Paddling by familiar landmarks was a tour in to the surreal. You marvel at the remade vista, all that water where air usually is, and at the same time, you know that for the buildings and people who live in them, there are months of work ahead. Oriental Harbor and pilings that are normally far above the water. We paddled as far as the watery route would allow, a path that went from South Water to Hodges, to First, to Freemason, Church Broad and Hodges and back to South Water and a towel. The eye was closing as the journey went on, and by 11:30, the winds — that were hastening the drainage in town, were also making the paddling more strenuous. Here are some more photos of the journey. 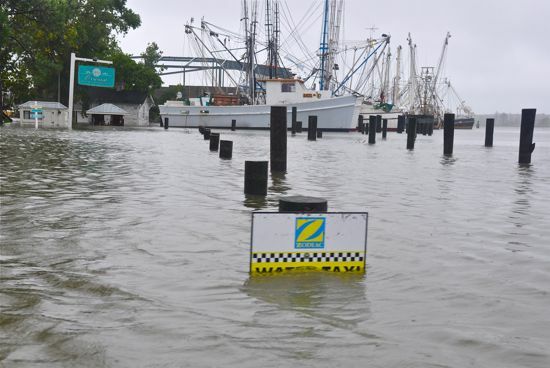 One thing to note: these water levels were photographed about an hour and a half after the peak of the storm surge. Things were flooded even more than shown here. The Inland Waterway Provision Company at Hodges and South Water. The Garland Fulcher Seafood Market. 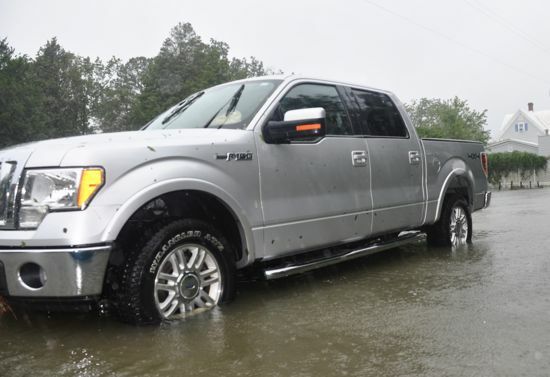 A truck was parked on First Street near the intersection of Neuse Street. That’s the Cartwright House in the background. 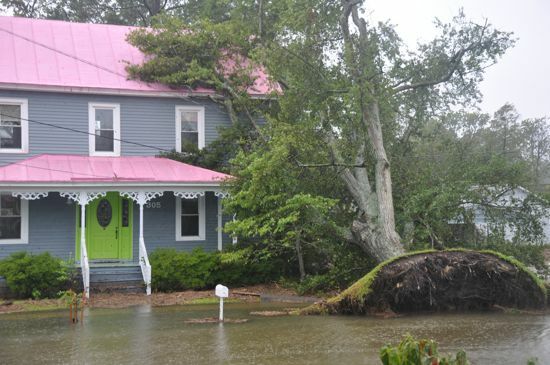 An oak in front of the pink-roofed house on Freemason was down Saturday morning. One nearby power pole was pushed over as well, and wires and cables hung in the waters. At 11a, Freemason was still traversable by canoe. 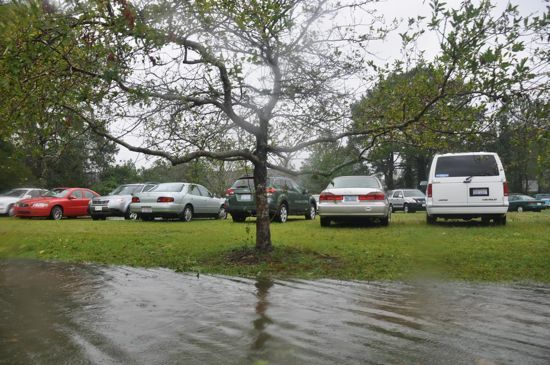 The Methodist Church Parking lot has traditionally been a place to park cars in hurricanes because it’s on higher ground. It appears that worked again. 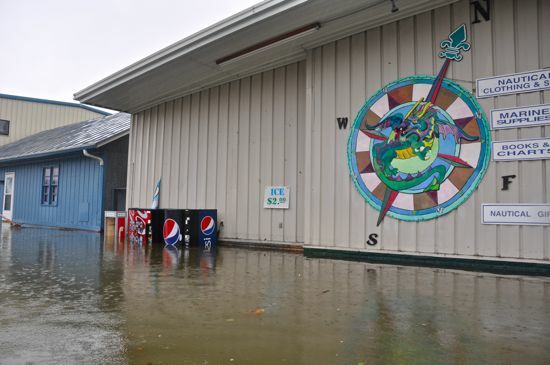 This photo was taken around 11a when the waters had receded about a foot.